Gather at Kindred on KK. Kindred, the signature restaurant at Kinn Guesthouse, is a place to dine together. Locally sourced New American fare is served at communal tables in a rustic-chic environs at this new Bay View favorite designed by Peabody’s staff. Like the Kinn Guesthouse, the owners of Kindred sought a dining space with a sense of community. To bring the owners’ vision to life, Peabody’s team centered a sharing table emphasized with modern light fixtures draped with Edison bulbs to shed an intimate glow. The menu palette is reflected in richly layered décor with myriad textures, burnished hues and unexpected touches. 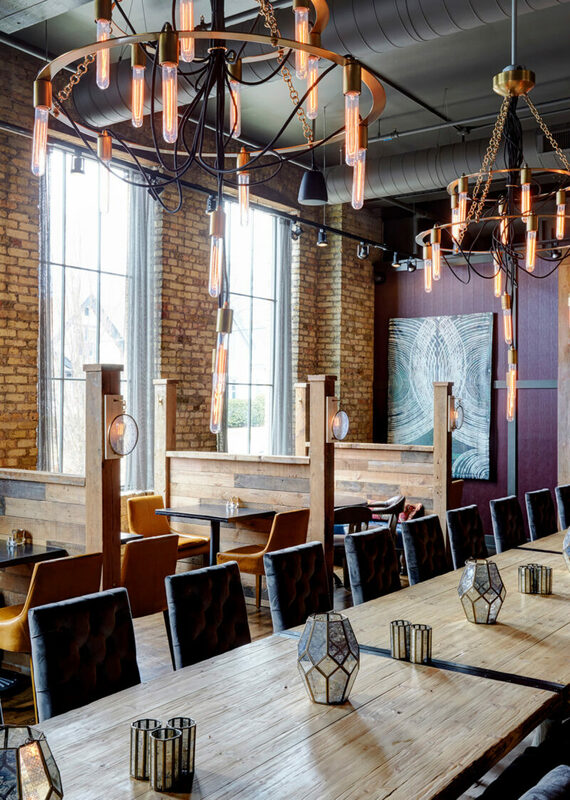 Warmth radiates throughout with the dramatic use of reclaimed wood, textured garnet-colored walls and mixed leathers. A lush layer of comfort is added with pillows covered in carefully-selected vintage fabrics donning plush velvet banquettes and tufted leather benches. Chain curtains contrast beautifully with Milwaukee’s beloved cream city brick.